I recently bought myself a new bike, a beautiful sky blue Pashley Poppy. Every time I look at her I sing ‘Isn’t She Lovely’ in my head. Poppy fills the most ordinary bike ride to the pub with delight; there’s something uplifting about the spring-like colour and the way you have to sit very upright, like you’re extremely proud of owning her. And this sort of quiet joy, I think, is key to surviving February. Because February is the kind of month where every time you leave the house, you’re disappointed anew by the coating drizzle, seeping into your clothing like the realisation that summer is many long, grey months away. With this sort of challenge to the spirits, it helps to make the ordinary more celebratory. And why not start with breakfast? Since entering this business that is catering, Tom and I rarely get to have breakfast together anymore (except for the odd hasty Sunday bowl of porridge). But then I’m often stumbling around, crease-faced and dressing-gown-swathed, long after most people have departed for the office, so don’t feel too sorry for me. I’m also a little slow in the mornings, which is perhaps why it took me so many unthrilling breakfasts of muesli or toast and marmalade which, nice as they were, passed unremarkably, until one day a couple of weeks ago some synapses connected in my pre-caffeinated brain and said, loudly, ‘pancakes!’ (I’m not a neurological expert, but I’m pretty sure that’s how my brain works). So I sprang into action, relatively speaking – one of the glorious things about pancakes is that even in a poorly stocked household you’ll have all the ingredients already – and I haven’t looked back. Cooking pancakes for yourself alone is, for me, just on the right side of self-indulgent – it’s not really necessary, but it feels in some way fortifying. It’s sufficiently more effort than pressing down the toaster button that you feel like you’re doing something nice for yourself, but it’s not so difficult that it can’t be managed while the coffee brews. 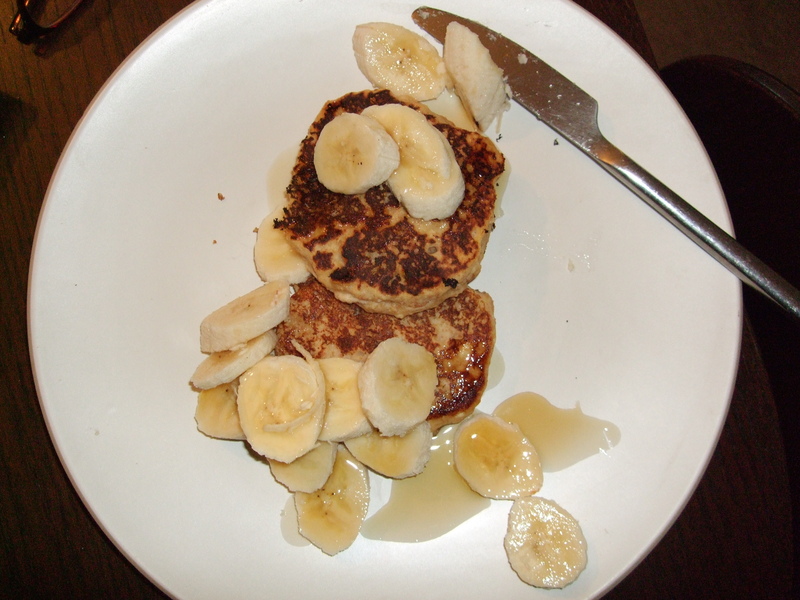 I have my favourite pancakes, which are an undeniably heavy (though I prefer to think of it as sustaining) banana and buckwheat combination. These are quite different, sort of wholesome and light. The recipe is one I cut out from Waitrose Food Illustrated, before its much more rubbish incarnation as Waitrose Kitchen, and which, I believe, originated with Miss Sophie Dahl. Apparently her TV programme was infuriating, but I never saw it, so I can enjoy her pancakes with impunity. I had a half tub of ricotta in the fridge which worked perfectly with the halved recipe (and if you feel like making your own ricotta, see my earlier post). Combine the ricotta, milk and egg yolk in a large bowl. Stir in the flour and baking powder. Whisk the egg white to stiff peaks in a separate bowl, and fold into the first bowl. Add the lemon zest, if using, and maple syrup, and stir in. Heat a little oil or butter in a frying pan and drop in dollops of batter, about one large tablespoon per pancake. Cook for a couple of minutes per side. Serve with more maple syrup and whatever suitable fruit you have on hand. Banana is always my first choice. Any remaining batter is fine kept in the fridge overnight and used the next day – it separates a bit, but will come together again with a quick stir.